Make delicious, home-made ice cream anywhere with the Yay Labs SoftShell Ice Cream Ball. Add some fun to just about any outdoor event such as birthday parties, barbecues, picnics or camping trips. Just add natural ingredients as simple as cream, sugar and vanilla in one end of the ball and add ice and rock salt in the other end. To mix the ingredients, simply shake, roll and play your way to a quart of delicious ice cream in about 25 minutes. Built-in handles make opening the ends easy – just flip back the handle to unlock. Wide and shallow canister makes it easy to stir ingredients and scoop out ice cream. Pure & Simple recipe booklet is included to spark your imagination. Also try Flavor Fountain flavorings (sold separately). Constructed from durable, food-safe, BPA-free materials. Easy to clean and dishwasher safe. Approximately 9.5-Inch in diameter. Fun! Go for smaller size for little kids. Fun! 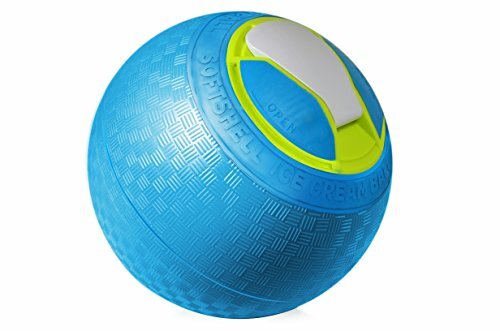 The large size is heavy and not a ball that the kids can kick around like the small size. Make sure you scrap the contents down well 1/2 through or you get mushy ice cream in the middle and a thick wall of frozen solid icream on the side. it’s really to heavy to kick like a soccer ball When filled, it’s really to heavy to kick like a soccer ball. Grand kids had a hard time rolling it around. They did like the concept, and the included recipe did make good ice cream. Five Stars My granddaughter loved it.